Live excavations take place here every year. Major new gallery opened here in 2011. 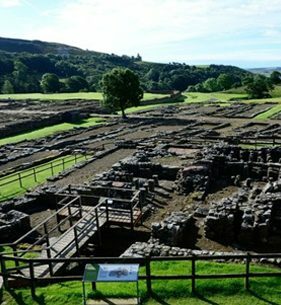 Vindolanda is one of Europe’s most important Roman archeological sites. Situated on the Stanegate road, the recently fully refurbished on-site museum provides a magnificent display of the many stunning objects found during the excavations. These include a remarkable and unique collection of leather and wooden objects that bring life in the fort and in the adjacent civilian settlement to life – shoes, clothing, tools, cooking, crafts like wood and metal working, military equipment, horse harness. The most amazing finds from the site are the thousands of writing tablets recording daily life – letters from soldiers asking for socks and underwear, a birthday party invitation to the forts commander’s wife, requests for payment, lists of goods supplied and troop deployments. The Vindolanda writing tablets were voted Britain’s ‘Top Treasure’. They are a truly unique and remarkable record of everyday life in the Roman Empire enabling visitors to connect with the real people to whom Vindolanda was home 2000 years ago! The site itself comprises at least 8 successive forts of which several were occupied before Hadrian’s Wall was built. Regiments from modern Belgium and Holland were garrisoned here. The visible stone fort dates to the early third century and the impressive remains include the fort walls, the headquarters building and the commander’s house. Extensive remains of the civil settlement lie just west of the fort with buildings lining a main street. Excavations take place on the site every year and attract hundreds of volunteers from all over the world. The site is owned and managed by the Vindolanda Trust. There is a cafeteria and a shop selling books and souvenirs available to paying visitors.